We have discussed an array of important terms in the last part of this post. Here we present another set of terms along with their definitions which will enrich you with more knowledge of call center industry. 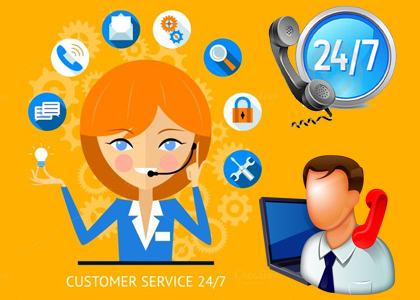 Quality of experience – It is the objective and subjective measure of overall experience of the customers with customer support of a company. Seated Agents – Also referred as base staff,it is defined as the minimum agents needed to accomplish the objectives related to response time and service time for a specific time period. Cost per call – It is a call center metric which is evaluated by dividing complete operational costs (variable and fixed) by total number of calls for a specific time period. DTMF (Dual-Tone Multi Frequency) – Also referred as touchtone, it is a signal generated by touching telephone keys which is sent to telephone line. It is an integrated part of interactive voice response (IVR) system. Agent Occupancy – It is the actual time spent by call center agents on handling outgoing or incoming calls. Workload hours are divided by total staff hours to calculate agent occupancy. This is one of most vital call center metrics that give the measure of productivity. Home-based agent: It is an agent that handles the calls or related work from home or a place other than the location of call center. Progressive dialer – It is a device which reflects the phone number and account information on the screen whenever the agent dials a number. Screen monitoring: A type of monitoring used by managers or team leaders to simultaneously check the screen activity of an agent. Scripts: These are the pre-written messages and phrases which are provided to agents by call center firms so that they can use it as a guide to answer the calls. These are generally different for outbound and inbound calls. Upselling – In call centers, it is a technique in which the agents convince the customers to purchase a product/service of a higher value than the one they originally intended to buy. Cross–selling – It is a technique in which an agent influences the customers to purchase an additional service/product along with the main purchase by the customer. Although, upselling and cross-selling are different sales techniques, they are often used synonymously by several call centers. Cost Center – It is defined as the process or department in the contact center that does not provide profits to the firm. Wallboard – Also referred as enterprise wallboard, it is a visual tool present in the call centers which displays performance-attributes like call queuing and service level in real time. Escalation Plan: A plan which dictates the actions to be executed in case the queue builds above the acceptable levels. Escalation volume – It is the number of queries/issues which are escalated to the managerial level. Speech Recognition – It is the ability of voice processing software to decode the words spoken by the users. This technology is also implemented in IVR systems by various call centers. Toll free number system – It is a system in which the charges of the call are paid by the center instead of the caller. Major toll free number prefixes include 800, 1800, 877, 888 and 844 etc. Workforce Management system – A system used for automating the tasks related to agent management like preparation of staff schedules, predicting the calls, evaluating the agent requirements and calculation of overall performance of executives. Voice Identification – A software system used to confirm the identity of a person by matching the spoken passwords to already existing computerized voice patterns. Net promoter – It is metric which evaluates the number of customers that would recommend the services/products to other people from their personal or professional life. It is a vital part of examining the customer loyalty. Promise to pay – It is an agreement in which a borrower promises to pay a certain amount of loan/debt on a specific date. This is connected with the debt collection services of a company. Percentage of calls blocked – It Is an important metric that measures the percentage of users that got a busy tone while calling the company. Blockage is caused by technology failure or due to high volume of calls. Needs-Met Ratio – It is the ranking of a customer on the scale of 1-10 related to the capability of a firm to meet the demands of the customer. Order Error Rate – Percentage of processed orders which have minimum one error in the information. The errors include incorrect delivery information, wrong product and wrong contact details of the customer etc. Understanding all these terms is essential for companies planning to outsource customer support or telemarketing process. It will help them in putting their terms to the outsourcing vendors in much better manner. This will also help these companies in choosing the perfect call center on the basis of processes and metrics implemented in the workplace. Therefore, use this terminology as a guide to have a better understanding of the call center realm.